Preheat the oven to 450 degrees F and line a baking sheet with foil. Set aside 2 tablespoons cilantro leaves for the rice. Puree the remaining cilantro leaves and stems, the serrano, garlic, 1/4 cup water, the lemon juice, 2 tablespoons coconut, 1/2 teaspoon salt and a few grinds of pepper in a blender until smooth, adding up to 2 tablespoons more water if needed. Toss the chicken thighs with half of the cilantro sauce on the prepared baking sheet; arrange skin-side up. Season generously with salt and pepper. Roast until the skin is crisp and the chicken is cooked through, about 25 minutes. Meanwhile, heat the vegetable oil in a medium saucepan over medium heat. Add the curry powder, turmeric and a few grinds of pepper; cook, stirring, until toasted, 30 seconds. Add the rice and cook, stirring, until well coated, 1 to 2 minutes. Add 1 1/2 cups water and 1/2 teaspoon salt. Reduce the heat to low. Cover and cook until the liquid is absorbed and the rice is tender, about 15 minutes. Remove from the heat and let stand, covered, 5 minutes. Fluff the rice with a fork. Stir in the cashews, the remaining 2 tablespoons coconut and the reserved 2 tablespoons cilantro. Serve with the chicken; top with the remaining cilantro sauce. Combine the paprika and oregano in a small bowl. 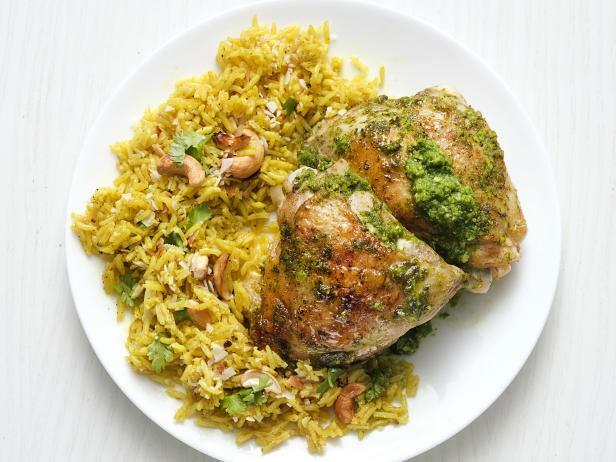 Rub the spice mix all over the chicken and marinate chicken for 1 hour in the refrigerator. Heat oil in a paella pan over medium-high heat. Saute the chorizo until browned, remove and reserve. Add chicken skin-side down and brown on all sides, turning with tongs. Add salt and freshly ground pepper. Remove from pan and reserve. In the same pan, make a sofrito by sauteing the onions, garlic, and parsley. Cook for 2 or 3 minutes on a medium heat. Then, add tomatoes and cook until the mixture caramelizes a bit and the flavors meld. Fold in the rice and stir-fry to coat the grains. Pour in water and simmer for 10 minutes, gently moving the pan around so the rice cooks evenly and absorbs the liquid. Add chicken, chorizo, and saffron. Add the clams and shrimp, tucking them into the rice. The shrimp will take about 8 minutes to cook. 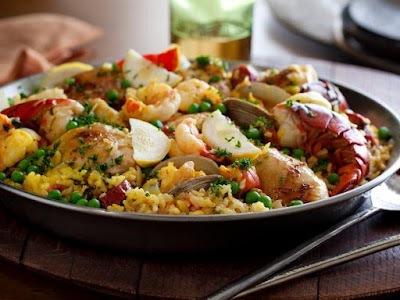 Give the paella a good shake and let it simmer, without stirring, until the rice is al dente, for about 15 minutes. During the last 5 minutes of cooking, when the rice is filling the pan, add the lobster tails. When the paella is cooked and the rice looks fluffy and moist, turn the heat up for 40 seconds until you can smell the rice toast at the bottom, then it's perfect. Remove from heat and rest for 5 minutes. Garnish with peas, parsley and lemon wedges. The ideal paella has a toasted rice bottom called socarrat. Add the wild rice to a medium saucepan with 5 cups of the chicken broth. Bring to a boil over medium-high heat, then reduce the heat to low and cover the pan. Cook until the rice has just started to break open and is slightly tender, 35 to 40 minutes. Set aside. Meanwhile, bring a pot of water to a boil and prepare an ice water bath. Blanch the broccoli by throwing the florets into the boiling water until bright green and still slightly crisp, 1 1/2 to 2 minutes. Immediately drain the broccoli and plunge it into the bowl of ice water to stop the cooking process. Remove it from the ice water and set aside. Heat a large pot over medium-high heat, then melt 6 tablespoons of the butter. Add the mushrooms and onions and cook, stirring occasionally, until the liquid begins to evaporate, 3 to 4 minutes. Add the carrots and celery and cook until the vegetables are soft and the mixture begins to turn darker in color, 3 to 4 minutes. Sprinkle the flour on the vegetables, stir to incorporate it and cook for about a minute. Pour in the remaining 3 cups of broth and stir to combine. Bring the mixture to a gentle boil and allow it to thicken, about 3 minutes. Pour in the heavy cream, stirring to combine. Let the mixture cook until it thickens. Add the salt and pepper, then taste and adjust the seasonings as needed. 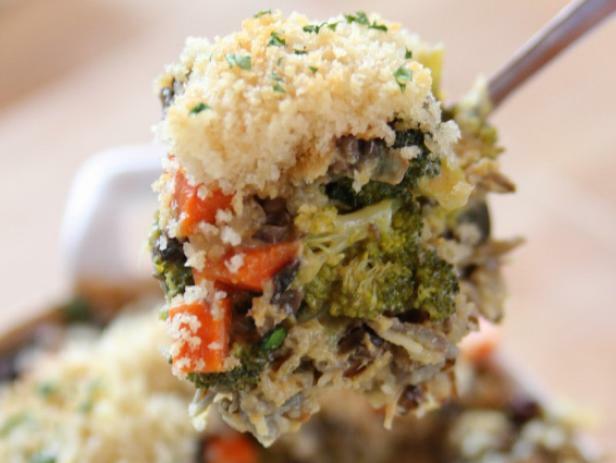 Mix together the cooked rice and broccoli and tip into a 2-quart baking dish. Using a ladle, scoop out the vegetable/broth mixture and spoon it evenly all over the top, totally covering the surface with the vegetables. Melt the remaining 2 tablespoons butter, then pour it into a separate bowl with the panko breadcrumbs. Toss the mixture together to coat the breadcrumbs in butter, then sprinkle the breadcrumbs all over the top of the casserole. Cover with foil and bake the casserole for 20 minutes, then remove the foil and continue baking until golden brown on top, another 15 minutes. Sprinkle on the parsley after you remove it from the oven. Kaushy Patel’s quick and easy rice recipe is made with cumin seeds, chopped tomatoes, turmeric and a homemade masala paste. It's great accompaniment to curries. 1. For the masala paste, grind or whizz the chillies, garlic and ginger with a pinch of salt using a pestle and mortar or a blender. 2. Heat the oil in a heavy-based pan for 1½ minutes. Add the cumin seeds and swirl through the oil for 30 seconds, then add the drained rice. Stir for 45 seconds, then add the masala paste and stir for 1 minute. Add the salt and stir for another minute, then add the tomatoes, butter and turmeric. Stir gently and cook uncovered for 2 minutes. 3. Add the hot water and stir for 45 seconds or until simmering. Cook for 6-7 minutes with the lid half covering the pan, stirring every 2 minutes to stop the rice sticking to the bottom, then reduce the heat to low and add 30ml water. 4. Put a large square of foil on top of the rice and tuck it into the edges of the pan. This will seal the rice and keep it moist while it steams. Cover with the lid, reduce the heat to the lowest setting and cook for 13-14 minutes. Take off the heat and leave to rest, covered, for 15 minutes before serving. 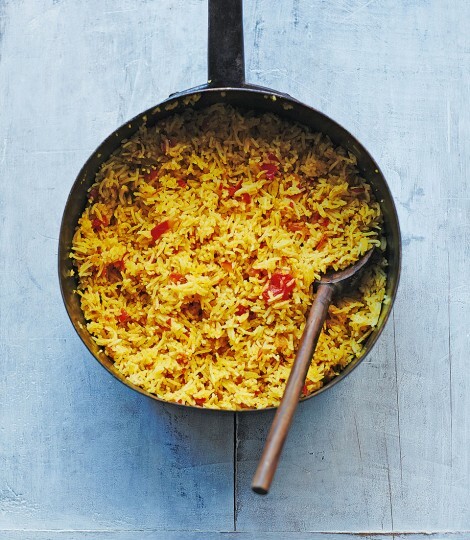 This recipe is from Prashad at Home by Kaushy Patel (RRP £25; Saltyard Books). This is best eaten on the day, but you could reheat it in the microwave up to 24 hours after making it. Store in a sealed container in the fridge. Bring a large pot of water to a boil over high heat. Add the rice and 1 tablespoon of the salt and cook, stirring occasionally, until the rice is tender, 12 to 15 minutes. Drain through a fine-mesh sieve and rinse under cold water to stop the cooking. Shake the sieve to drain as much water as possible. Melt the butter in a large nonstick skillet over medium heat. Add the rice and the remaining 1/2 teaspoon salt and stir with a heatproof rubber spatula to coat all the rice with the butter. 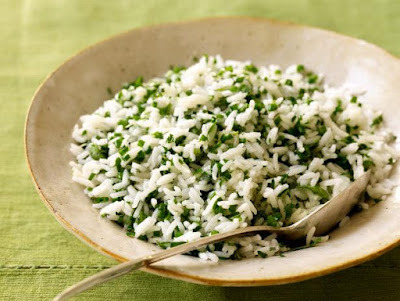 Once the rice is warmed through, about 3 minutes, transfer the rice to a serving bowl and add the herbs plus additional salt, if needed. Stir with a fork to incorporate and fluff the rice and serve warm or at room temperature. 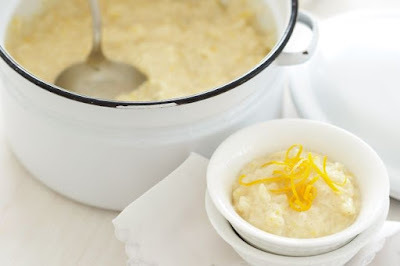 This orange scented rice pudding for four is a delicious treat. Step 1 Combine milk, coconut milk, rice, orange rind and juice, star anise, cinnamon and sugar in a medium saucepan over medium-high heat. Bring to the boil. Reduce heat to low and cook, stirring occasionally, for 40-50 minutes or until rice is tender and liquid thickens. Remove from heat and set aside for 5 minutes to cool slightly. Step 2 Spoon evenly among serving bowls. Top with orange zest; serve immediately. Bring a large pot of well-salted water to a boil. Place the rice in a large bowl, rinse with cold water and drain in a colander until the water runs totally clear. Drain well. Add the rice to the pot and boil until the grains are soft on the outside but still hard at the center, about 6 minutes. Drain the rice and rinse under cold water. Measure out 1 1/4 cups of the parcooked rice and transfer to a bowl; stir in the yogurt, the 1 tablespoon melted butter and 1/4 teaspoon salt. Melt the oil and the remaining 1 tablespoon butter together over medium-low heat in a 2- to 3-quart nonstick pot with a tight-fitting lid. Add the yogurt rice and spread it evenly to cover the bottom of the pot. Add the remaining rice, mounding it into a pyramid shape. Insert the handle of a wooden spoon into the mound 3 or 4 times to make vents for steam to escape. Increase the heat to medium-high and cook until the rice starts to steam, about 2 minutes. Reduce the heat to medium-low and cover the pot, first with a clean towel and then with a lid. Steam until the rice is fully cooked and a golden brown crust has formed on the bottom, about 50 minutes. 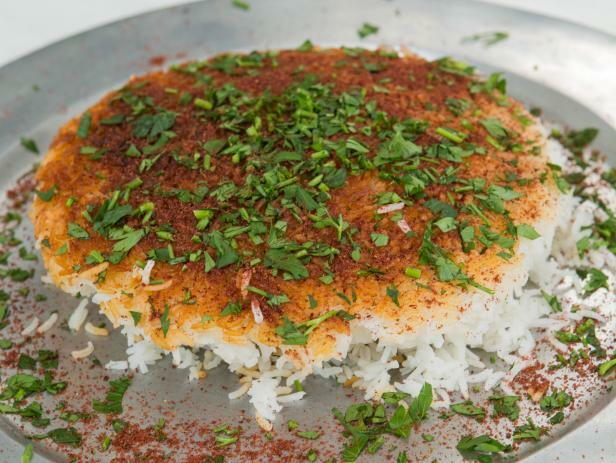 Spoon the loose rice onto a platter, then use a firm spatula to remove the crust from the pan. Top the rice with the crust and sprinkle with the parsley and sumac if using. Serve immediately. Can White Rice Be a Healthy Food Choice? Rice Recipe - Enjoy the best collection of easy rice recipes. Try Fried Rice recipe, Indian Rice, Italian rice, Chinese rice, Japanese rice, Mexican Rice, Moroccan rice, Lebanese rice, Thai rice and more delicious rice recipes.